RazorMotion is a highly automated driving platform designed for application development and evaluation of advanced driver assistance systems (ADAS). It combines premium hardware with the MotionWise software framework. The design is based on several years of experience in the ADAS domain and is ready to act as an A-sample to reduce time to market for product development. RazorMotion reaches further than classical evaluation platforms by implementing a design close to series requirements which enables it to be used during the development process as well as during the testing phase in vehicles. Combined with the proven software framework of the middleware MotionWise, RazorMotion is ready for any safety-critical mission and serves as a powerful platform for the evaluation of future ADAS. The combination of two Renesas R-Car-H3 SoCs and the Renesas RH850P/1H-C MCU is the perfect mix of processing power and automotive microcontroller resources to target the autonomous driving era. 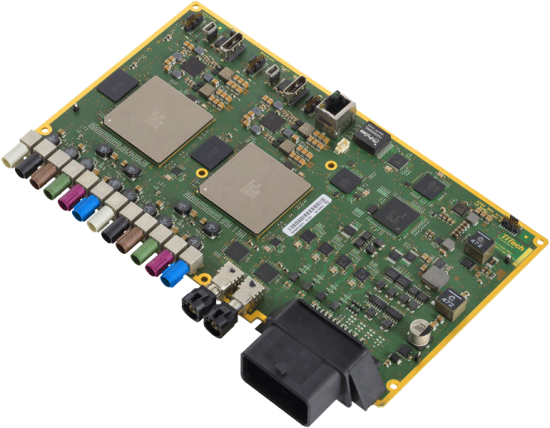 The ARM Cortex A57 (quad) and A53 (quad) cores of the R-Car-H3 together with its real-time image recognition processor (IMP-X5) and PowerVR GX6650 GPU provide the computing power to handle the input from up to 12 camera interfaces. The RazorMotion architecture is based on a series-proven technical safety concept. The integrated hardware measures include i.e. safe state switch-off paths, a dedicated independent watchdog as well as voltage monitoring resources. The RH850P/1H-C provides on-chip features for hosting applications up to the highest ASIL. In addition, a Deterministic Ethernet backbone enables safety-critical application data exchange. Together with the MotionWise software framework from TTTech, the RazorMotion platform is ready to host applications up to ASIL D.